Only Lief, an outspoken new guard, can see past Twylla’s chilling role to the girl she truly is. 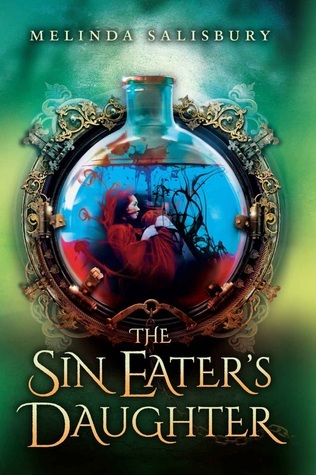 I’m not sure what to think about The Sin Eater’s Daughter! I really liked the overall feel of the book, and in some ways, I was very much reminded of a lot of other YA fantasy. Not in a bad way, because I haven’t read enough YA fantasy to really compare it to other books, but I couldn’t help but be reminded of them. I thought the idea of a girl who has to ingest a deadly poison every month because she was chosen is really interesting. She was previously destined to become a sin eater, and while we get an idea of what her life would have been like if that had been her role, I expected it to be more important than it was. Probably because of the title, and the fact that I don’t pay attention to summaries before I read a book. But it was more a background thing that her mother did, and not something Twylla did, so I was really disappointed that it wasn’t something Twylla did. Still, I get why she wasn’t a sin eater, even if I was expecting that to be more of a thing. I loved the mythology of the world, and how it come to be. It really stood out, especially with the religion in Lomere. And how it wasn’t what you originally thought, and everything the Queen went to make sure things went the way she wanted…she’s appropriately evil and twisted, and it’s more than what I expected for YA and yet I liked how twisted she was. It made me wish that we saw more of the world, but since this is the first in a series (I’m assuming trilogy, because you don’t see many non-trilogy series out there), I’m sure we’ll be seeing more of the world. I’m not sure how I feel about either love interest. I get the prince, and even the guard makes sense, but I didn’t really feel it with either one. (But between you and me, if I had to pick, I’d totally go with the prince, because there is no way I’d want her with the guard after everything we learn). I’m also not sure how I feel about Twylla. Honestly, I’m feeling neutral, because I really couldn’t tell you anything I particularly liked or disliked about her, even though it hasn’t been that long since I’ve finished the book. 3 stars. I liked it, especially the world, but I’m also not sure about the romance or about Twylla.